This is part 2 of 3 of the motivation series. We have a lot of things on our plates, are busy spinning our wheels and our to-do list seems neverendingly long. It´s like being in a fast carousel. All we want to do is to tell the operator of the carousel to stop it, so we can step out and have a break. But there is no operator and the carousel keeps on rotating. Mostly overwhelmed by all the things we need and want to accomplish in a certain time. This overwhelm can be so strong that it can be even paralyzing. Sit in your yoga pants with a messy bun on your couch and eat cereals while scrolling through social media. Even going into the kitchen and cooking a real meal sounds like a lot of work. You feel simply done, don´t want to do anything and don´t even know where you could possibly start. This is how I used to feel and act in the past whenever I felt overwhelmed and paralyzed by all the things I wanted and had to do. In the process of being paralyzed, I ignored all the work and hoped that they would magically disappear. Of course, they didn´t I just postponed them to “later”. This strategy worked pretty well for a couple of years, especially when I was a single student. But I didn´t want to be a single student for the rest of my life and was fed up with feeling overwhelmed and paralyzed by my to-do list. I decided to find a solution what I can do whenever I feel overwhelmed and a way to avoid overwhelm in the first place. 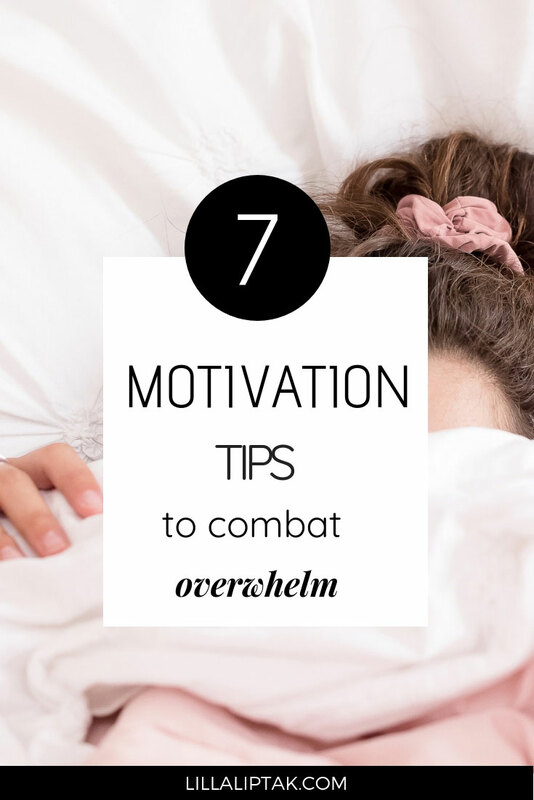 In this post, I´m going to share with you 7 simple motivation tips I use and you can use too whenever you feel overwhelmed. Feeling overwhelmed is usually a combination of focusing too much on your to-do list + too little on yourself. Therefore my first 2 motivation tips are to focus in the present moment on yourself. Whenever you find yourself in the situation of being paralyzed the best thing I found to be good is to unplug and to rest. Sometimes a little nap can already work wonders. It depends how paralyzed you feel and how your circumstances are. Maybe you can even extend your little nap into a day of relaxation. Going for a walk is another great strategy you can use to freshen up your brain and to lighten up your mood. Being outside, inhaling fresh air, soaking up a little sunshine and moving helps your organism to relieve stress and to relax. Besides taking a nap and going for a walk take 1 hour and spend it just on yourself. Do something you really enjoy doing. Whatever it might be what you love to do, do it. Do whatever you perceive as soothing for your body, mind, and soul. Use your imagination to find out your future vision. How does your ideal life look like? 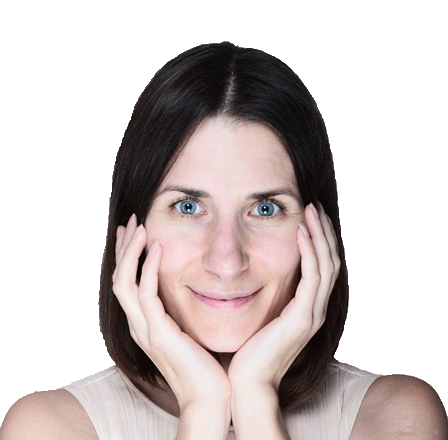 Use the level 10 life concept to get clear on the bigger picture of your ideal life. What do you want to accomplish in which time and why? Make for example a 1-year goal for yourself and re-engineer the process. Take the outcome you want to have and break it down in milestones. For example, break down the 12 months goal into 4 milestones. Every 3 month a milestone. Which 4 bigger steps lead me to my end goal? Once you identified your 4 milestones take these and break them down into smaller steps. The purpose here is to break down these milestones into tiny little steps you can walk every day. This way your go every day for your goal and don´t feel overwhelmed by it. If 1-year goal sounds too much start with a 3-month goal. Ask yourself what you want to accomplish within 3 months and break it down into 3 milestones. 1 milestone per month. Take these to break it down even further until you have a step you can take every day to move forward. Schedule your milestones in your journal. This way they won´t get lost. Get an accountability partner on board. If you know someone with the same goal, connect and do support each other. Once you took a nap or went for a walk & took a little time for yourself, know what you want you can start evaluating what’s really important & what you want to accomplish right now. I personally like to use the Eisenhower matrix to evaluate what’s really urgent and important right now. Prioritizing and moving step by step from one task to the other is the key to get things done without feeling overwhelmed. Urgent things are external things like deadlines & emails which have to be answered. = External driving factor. Whereas important things are the things which you really want to do because it´s important to you. = Internal driving factor. This matrix will help you evaluate the things which need to be done and the things which can be delegated or deleted. You know your priority now it´s time to follow through. Oftentimes we feel overwhelmed because we have taken on too much. You don’t have to do everything for everyone all the time. Be comfortable with saying no. Declutter and let go of all the distraction you don´t need and don´t want to have in your life. All clutter is distracting and holding you back from reaching your goals. Let go of them and minimalize your physical and mental space. Make room in both for the things you really love and want in your life. Take a nap or go for a walk to relax your mind. Do something you love and enjoy doing just for yourself. Take at least 1 hour for self-care. Extend it to a full spa day if you feel the need to do so. Be clear on your future vision. Where are you heading in life and what kind of life do you want to create for yourself? Set a 3 months goal or a 12 months goal and break it down into milestones. Schedule your milestones in a journal. Search for an accountability partner with the same/similar goal. Break down your milestones into weekly and daily steps. 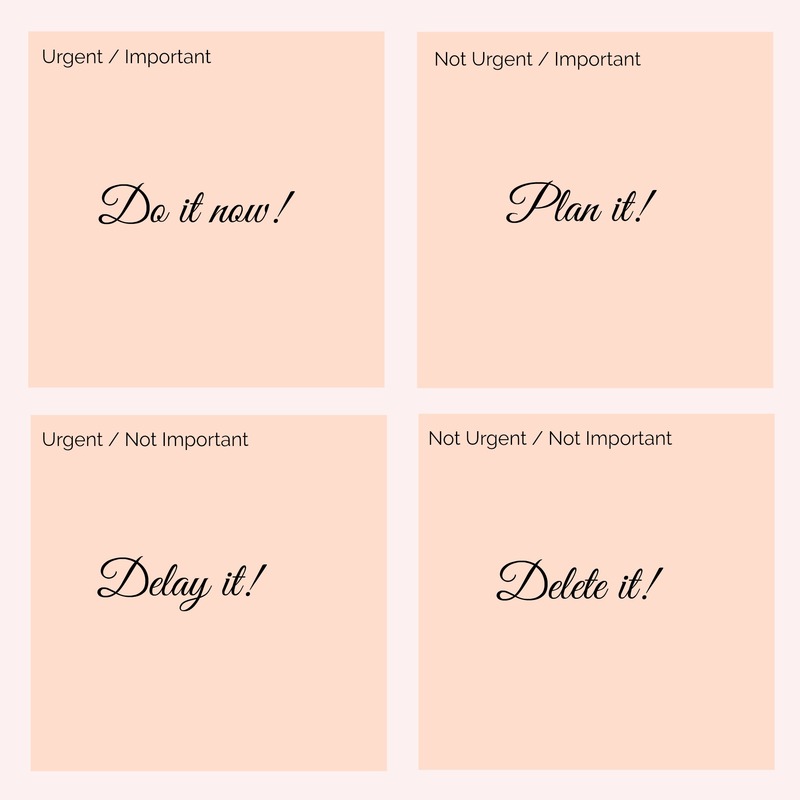 Use the Eisenhower matrix to determine what´s urgent and important to you and what isn´t. Prioritize every day and do the urgent/important tasks first. Learn to say no to the things which aren´t important to you and to the things which distract you from your goals. Be kind but don´t be a people pleaser. Let go of all the things you don´t want and don´t need in your life. Physical and mental clutter weighs you down and hinders you reaching your goals. Let go of them. Stay focused on your goals, track your habits and take it step by step. 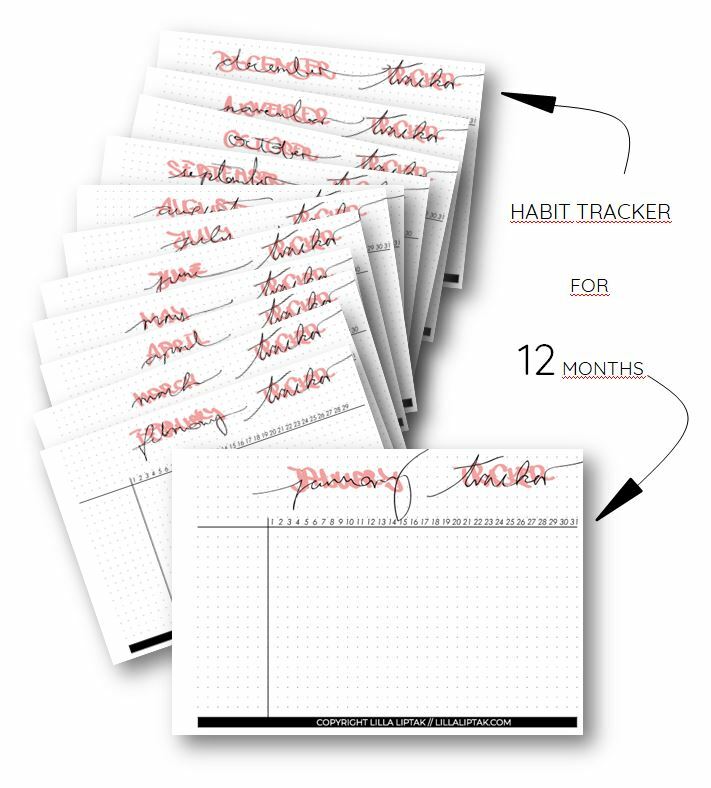 Use this12 months habit tracker to track your progress.